While the University of Kentucky is probably best known nationally for its basketball program, an argument can be made that its opera program isn't that far behind Wildcat basketball in terms of national recognition and recruitment of students. 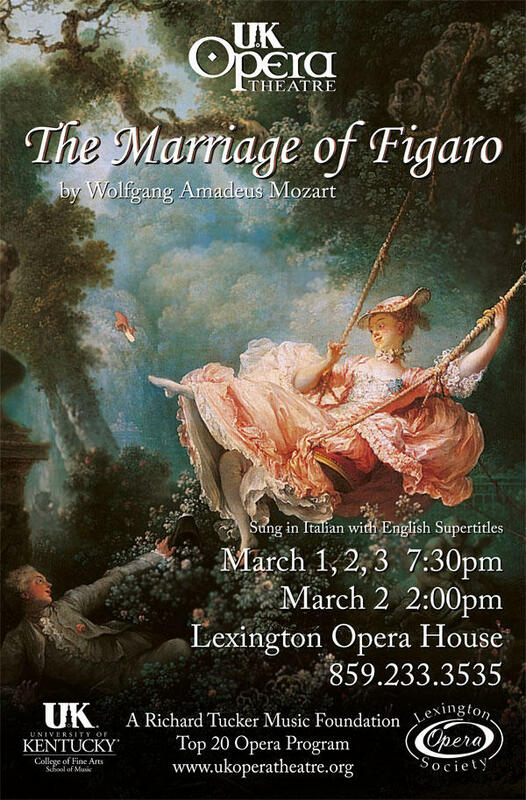 This weekend, the UK Opera Theatre Program presents Mozart's The Marriage of Figaro at the Lexington Opera House. Director Everett McCorvey notes that this facility is uniquely suited for both performing and hearing Mozart's work, as it both has good acoustics and the audience is never far from the stage, allowing the listener to be more intimate with the performance. It's also not challenging to the musicians and vocalists to have to struggle to project in what would be a larger hall. In addition to having the perfect setting for the particular opera, McCorvey notes that Mozart's writing is perfect for younger voices. Once a year, the non-profit Lexington Area Music Alliance presents a day-long series of workshops and live performances for musicians. Tom Martin is a member of the group and says the goal of LAMA-RAMA is to nurture the local music scene. Lexington hosts over 200 visual and crafts artists this weekend as the Kentucky Arts Council presents Kentucky Crafted: The Market at the Lexington Convention Center. This is the 31st annual festival and marks its second year in-a-row in Lexington. Arts Council Executive Director, Lori Meadows, spoke with Arts Weekly's Roger Duvall.